1. The bottle seems a little heavy. Obviously because its full. But even then , none of my previous Olay bottles felt this heavy when they were full. 3. The size is different. The previous ones were slightly longer and less rounder. That is say a minute difference of 0.5 cm or maybe 1 cm difference. 4. OMG the smell. the smell of this one totally put me off. Its so weird. Nothing like the pleasant smell of the other ones. I just couldn't take it. 5. Its too thick. I only pump the bottle once and use that amount. I did exactly that this time, but when I applied it on my face it felt heavy, thick and made my nose oily. Then I started sweating on my upper lips. Something which has never happened with me when I used to use Olay before. It felt as if I had just put the ponds white cream on my face. 6. The color looks pinkish/ peachish in a very weird way. I know Olay was never white, but this just seems so weird. I thought I was dizzy or something because it looked a different color. 7. Tingly feeling on the cheeks. Now I'm really not sure if it because of this stupid ( fake ? ) Olay or something else . Or maybe I'm imaging things. But I've been itching on my cheeks, I've already scratched it a couple of time, anymore and i'll develop red marks. 8. Bad English ! The bottle and the cover both say " Keep out of reach FOR children" Why would P&G let that get printed on their product. Its wrong English. Bad grammar. OMG. I don't expect P&G to have mad that mistake. This was manufactured on 18th November 2010. So no its not expired. It keeps for 3 years . I know there is one for sensitive skin and one for normal. I have used both. And know how both feel. This one feels nothing like the previous ones. I bought it from a decent shop. I've bought other stuff from that shop too. Now I'm very confused. I paid 699 for this thing and think its a rip off . Olay Total , Totally fake ? What do you think ? What should I do ? Should I write to P&G ? Should I take it back to the shopkeeper ? I'm very confused :( "
I bought it in 2009 and it is old and I don't use it anymore, but it still smells good. The price of mine is Rs.650. Did they increase the price??! Wow. I think in manufacturing, it's almost impossible to make the product exactly the same. I once bought The Body Shop Passion Fruit Body Butter and it was SO bitter! Omg it was the worst thing ever. It made my hands obnoxiously bitter, and the bitterness was hard to wash off as well, yuck! Another time at a TBS store I told my s-i-l not to get it & to taste it first lol, but it wasn't bitter at all. The same goes for the packaging, and maybe it's a different maker. But the smell is what worries me with yours. They are stupid to change it if they did. I liked it a lot. I don't think it's a fake, but if you're still worried then you can write to them and give them the product number of any other number on the bottle. Please feel free to offer your suggestions everyone. It's most likely that they have reformulated the product inside, this would be why it feels heavier (the product) and the smell is off. A lot of brands do this without telling the consumer so if you've bought it from a legit source, that's the most likely outcome as I can't see stores buying something that is not official as the bad publicity would kill the store. Hey Cynth, actully its writtn in my mommy's olay too, bt its d orignal 1 nt fake neithr is urs cuz d fake 1 costs in Rs.500 range. My bro hd got it fr mommy & shopkeeper said wich u wnt d orignal 1 or d fake 1...??? orignal 1 is pricd sumthin' arund Rs.700 & d fake 1 is rangd Rs.500. So dn't wrry. & dt mistk is common in evry bottle. Agree with Tanveer, firstly speak to the shop owner you bought the product from.Then write to P & G with the batch no. details & all, if its genuine you'll get to know if not its better to let the company handle the counterfeit product. Either way if the formulation isn't suiting you don't use it.Whether the product is part of a bad batch or counterfeit either ways your skin's more precious than the price of the cream. Yes, speak to the shopkeeper. But in either case you should write to P&G..
you should take it back to the shopkeeper. I don't know if anyone has seen this but on the news a few days back they showed how the police caught a HUGE shipment of Fake Skincare products in India. And most of them were...yes, OLAY! According to the newspeople, Fake products are very common esp if you buy them in smaller cities. 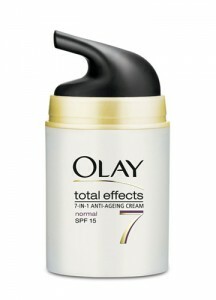 And they showed a lot of fake Olay Total Effects bottles. The one in question might or might not be a fake, but its certainly possible! Hi...I bought the same bottle as the one in your photographs...mine cost Rs. 500. Once I opened it I pumped it several times but in vain. No product came out. I opened up the bottle (after a lot of effort) and the product inside was orange and completely dry! I immediately went and bought another bottle and there was A MARKED difference between the writing on the back of the second and the first. The writing on the back the dry/bad one looked exactly like the one in the photo. The second/good/original one was a much smaller font (like my previous bottle which had finished) and most importantly included THE INGREDIENTS. If you have the bottle shown in the photograph PLEASE STOP USING IT. Its 99% a fake and u dont want it on your face. I was lucky coz the product in mine was totally dry. having worked in the FMCG industry I can tell you that companies cannot make random changes in the text in the back without serious consequences - and they especially cannot miss out the ingredients list. yes u r right its a fake one!!! i got the same bottle(as in the picture)for rs.699,but didn't use it as i doubted its originality.i talked to the shopkeeper about it but he denied! !still i am having the bottle with me i dont know where to claim for the money i spent on this fake product n how to teach these shopekeepers who sell duplicate products.. It will take action on your complaint. 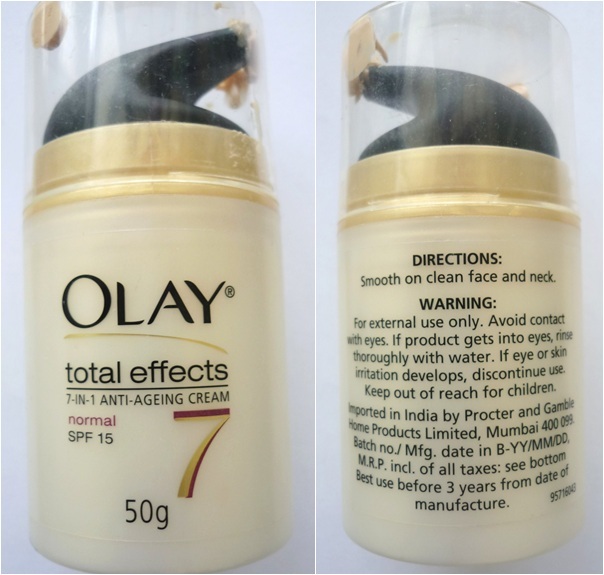 In addition, if you look at the bottom of the fake Olay bottle (like the one in the picture) there is no date of manufacturing or expiry date. Another major thing which a company like P&G CANNOT miss out. Again, please be careful with this product! My vehemence here comes from the fact that the original Olay Total Effects has really helped my skin and I would hate to see cases of once bitten twice shy for others with one of my all time favourite products...hope this was helpful. OMG ! Thanks for the info Arunima. I felt weird when I used this one, though i used it only once it was enough to make realise that either the product is fake or they changed the ingredients or the composition. Yep, mine looks like the one in the post and I have a pretty darn good feeling that its fake. So i have written to P&G and posted the same to Olay as well. Lets hope I get a reply or else I'll go talk to the shop owner. Arunima- I bought mine in 2009, that's why it's cheaper. How can it be fake when I was just launched in India and not even popular yet for people to dupe?! Manufacturing date and ingredients are written on the box. The only point I can make is that, fake or not, real Olay is not "too thick" for anybody. Okay it might be too thick for people who re oil factories, but Olay just gets absorbed so quickly and makes your face feel as if you haven't put anything on it. I have a friend who has extremely extremely oily skin but she loves Olay as well. So , we still dont know if this fake or not. For all we know, it might be a bad batch or a different manufacturer like Cynthia said. anyway...since the bottle that u bought in 2009 looks identical to the one I bought in 2011 it is quite possible that fakes were repackaged with bad product in old bottles that Olay produced in 2009...ppl please beware!! Kritika- glad that u wrote to them. Hope u get a response soon. I have no idea why they fake Olay?Olay price here is arround 11USD,and in south east asia P&G factory is in thailand.There are factories of:Unilever Indonesia,Mandom Indonesia,Kao Indonesia,Sara Lee Indonesia,etc but not with P&G. Is your Olay made in thailand too?There are some counterfeit products,usually"pricier"brands like MAC,Bobbi Brown,The Skin Food,and Etude.But not with olay(since it's more affordable).I think maybe they change the formula or something..
Hey C ! Thought I'll just update you. So I called P&G and they tracked my complaint and looked up the batch number and manufacturing date. And guess what ?! It doesn't show up on their system. Showed an error and a gap of two months between both which cant be possible if its an original. The lady also mentioned that they havent changed the packaging and it HAS to have the ingredients list. She advised me to return the product to the shopkeeper. And I did. And the guy did not argue about it and gave me the money. I went to another shop , and bought another one and that is a huge shop. Quite reputable and he informed me as to how there are fake Olay products going around the market. I came home used this one, and I can bet my life on it that's its real. So happy now ! Moral of the story, if you have a doubt about your product, call the company and they can look up and match the batch number and the manufacturing date. Ps. P&G have started manufacturing Olay in India now.Its now being made in Solan, Himachal Pradesh. My Olay doesn't hav this warning of keeping out of reach of children.. I want to know how u contacted P&G and in how many days did they get back to u. And also, this one says Keep out of reach OF children. Lol. No bad grammar here. That one was definitely a counterfeit ! Kritika- Oh that's great. LOL glad there's no bad grammar on the new one. So cool that the shopkeeper gave back yr money!